The executive producer discusses the making of Season Two's classic finale. 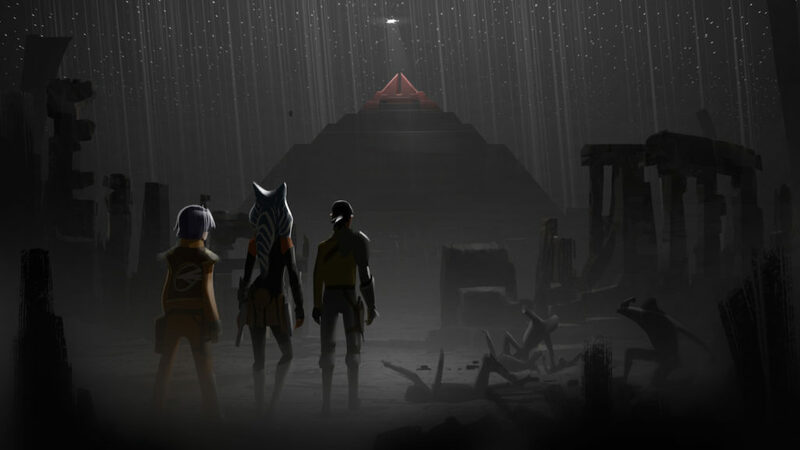 In the final installment of our recap interview on Star Wars Rebels Season Two (and in case you missed it, you can check out part one here), executive producer Dave Filoni and StarWars.com discuss the memorable season finale, including Sith Temple design, the return of a certain Zabrak, and a duel that was years in the making. StarWars.com: I want to start off with Malachor itself and how you came to develop the look of it, from the bodies on the ground to the look of the Temple. Dave Filoni: I liked the idea of the episode occurring on a graveyard planet. As Simon Kinberg and I developed the story, I started thinking about Sith Temples and how this one might be underground in a massive cavern. That would allow us to poke holes in the ceiling so beams of light could stream down into the Temple. When the characters are above ground, it’s daylight and they’re looking down at a black surface. When they are below, it’s nighttime and they’re looking up at what seem to be stars. The design elements were important to reinforce the concepts of night and day, light and dark, life and death. Those things are part of Malachor’s DNA and its architecture. 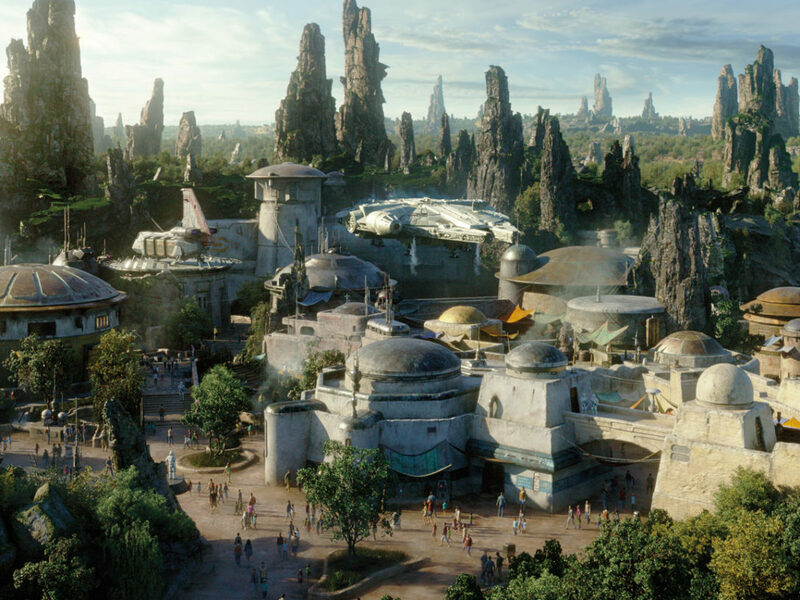 StarWars.com: The other thing I noticed about the Temple itself is, much like the [architecture of the] Empire versus the Rebels, the Sith Temple is much more clean than the Jedi Temples we’ve seen. Dave Filoni: That comes from what Star Wars history tells us about Sith Temples. 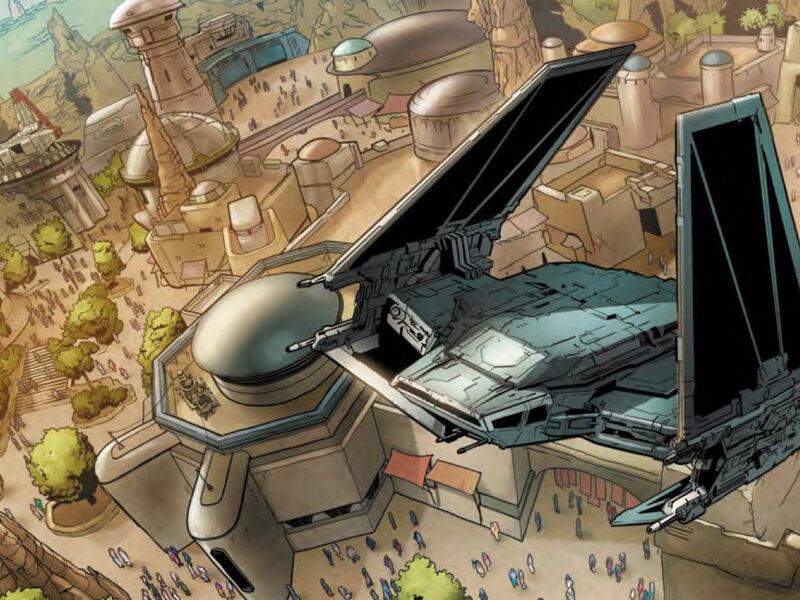 If you look at the Malachor Temple geometry, it’s actually identical to Moraband in Clone Wars. In this instance, the rock was lined in black and red. It was important for the red lines to be like veins. When power came into the Temple, the entire structure seemed to come to life. Visually, the Temple is a series of plateaus. On each level, we staged critical scenes allowing the characters to make decisions about their destiny. They discuss their fate on the way up, and then make a decision on the plateau. That staging of the action was very intentional. As they get closer to the top and their ultimate goal, everything comes to a point. I like the tension in that. StarWars.com: It gives you structure, too. 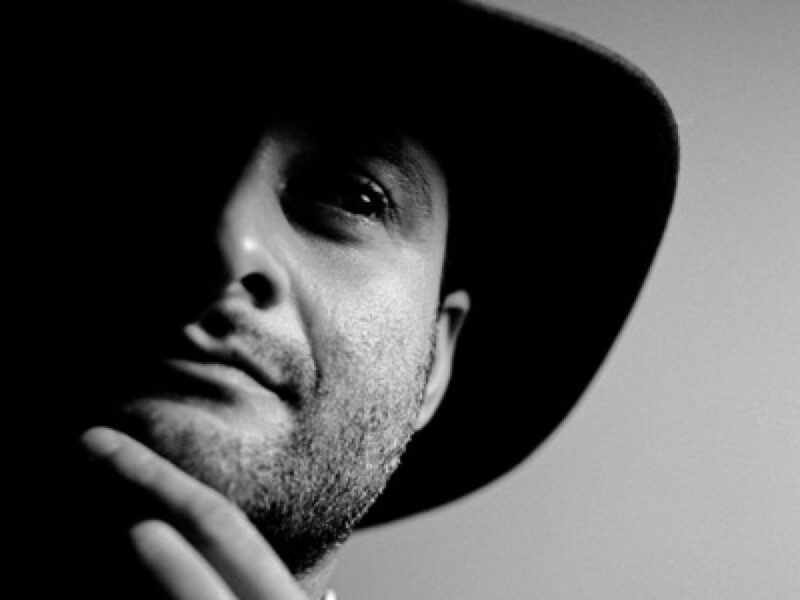 Dave Filoni: It gives visual structure and emotional structure. The design is really important. The Pompeii figures in the Temple are another example. They were added to give the location a sense of history and to tell you visually that there were other lost souls in this place. StarWars.com: No chance those were the Philadelphia Flyers, is there? Dave Filoni: [Laughs] No. At the end of the day, I wanted to give the sense that there was a battle in this place long ago. I actually wrote a short history of that battle and the Sith Lord that built the Temple. She was a very ancient and powerful Sith. That backstory inspired me to ask Nika Futterman to be the voice of the Temple. I thought it would be a nice nod to her Clone Wars character, Asajj Ventress. StarWars.com: So when Ezra first meets Maul, I kind of saw it as this dark side version of when Luke meets Yoda. Is that what you were going for? Dave Filoni: There is a bit of that. I intentionally wrote some of his dialogue to reflect Yoda. Ezra is faced with many challenges and he thinks power will solve everything. In that way, he almost draws Maul to him. Of course, Maul has a purpose for Ezra, too. 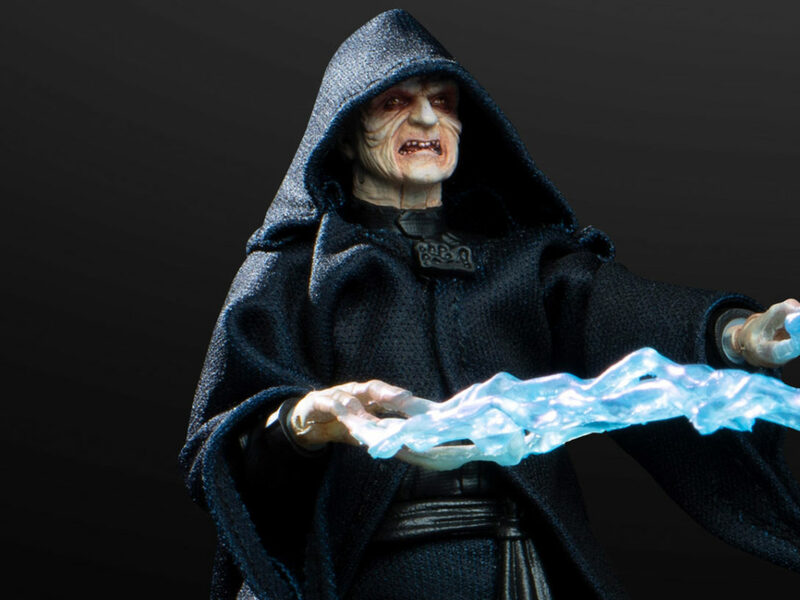 The idea that he would want to possess Ezra, to me, was very easy to understand and more sinister than just, “I want power.” When the Emperor [said], “You, like your father, are now mine,” in Return of the Jedi, that terrified me as a kid. The idea of the possession of a father and a son was really scary to me. I wanted to capitalize on that idea — that Ezra, in his quest for power, would succumb to the allure of this more powerful figure and the promise of power. StarWars.com: Let me ask you about Maul. Because watching him in this episode, he seemed so much like Palpatine to me, the way that a son might pick up the characteristics of his father. I’m wondering — if Maul was given the chance, even at this later stage in his life, to reclaim the mantle of Palpatine’s apprentice, do you think that he would? 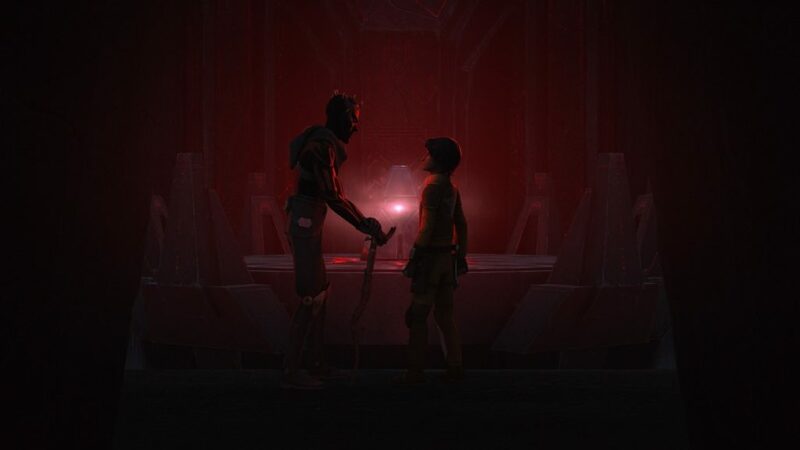 Dave Filoni: I think Maul understands how unimportant he was to Palpatine, so he would seek revenge and try to usurp that power if he could, but he would never fall back in line with it. StarWars.com: Was he really there, like he said, for years? Dave Filoni: I believe he was. I think he arrived on Malachor and was trapped there. His ship broke down and he was stranded on this largely lifeless planet and was tortured by the fact that he was so close to obtaining the ultimate power, the Sith holocron. Of course, he can’t do that alone. The only way to obtain this level of power is through cooperation and we all know the Sith are terrible at cooperating. StarWars.com: When they get to the top of the Temple and it’s time to make the leap, it calls back to Kanan and Ezra Force-throwing each other, which was introduced earlier in the season. Which came first: the idea of using the Force in that way, or this test? Dave Filoni: It was more the fact that we had already done it and it was an ability we knew the characters had. StarWars.com: It kind of worked perfectly [in the finale]. 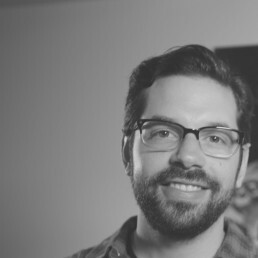 Dave Filoni: It works here because it was something that Ezra had always done with Kanan, his father figure. When he does the same thing with this kind of surrogate father-mentor, Maul, it’s relatable. That happens in our own lives. You grow up playing a sport, you get a coach, and suddenly you’re playing ball with your coach all the time, and the person who taught you how to play in the first place is jealous. Sam Witwer deserves tremendous credit for his performance as Maul, especially in the finale. He really makes you open to the idea that Maul might be on their side. You don’t have to believe that Maul is good, you just have to believe that his willingness to destroy the bad guys is outweighing his willingness to destroy the good guys. The moment where Maul grabs the holocron and is holding Ezra off the cliff is key. He could kill Ezra right there, but he doesn’t. So many people have told me, “I hate myself for saying this, but I believed him in that scene.” I always say, “Well, then, you’re just like Ezra.” Why wouldn’t you believe him, considering everything Ezra has been taught up to that point by Kanan about believing in people, trusting his instincts, and trusting in the Force? Ezra trusted Rex and he was right about Rex. They trusted Ahsoka and they were right about her. He doesn’t know Maul’s history or what he’s done. Sure, he might look scary, but he shouldn’t judge people based on the way they look. Ezra was a street rat once, too, lost in his own way. StarWars.com: Although, the way he said “Maul” was very creepy. That should have been a warning sign. Dave Filoni: [Laughs] He can’t help himself, he’s a scary guy. StarWars.com: The blinding of Kanan is really a shocking moment in an episode full of shocking moments. When did you decide you wanted to do that? And I’m wondering if it was debated, because a character change like that is going to impact a lot of things. I think it’s going to impact how you tell stories in the future and how you approach the character, because, in theory, he’s not going to be able to do things like he used to be able to do them. Dave Filoni: It’s interesting. We had decided that we were going to do something dramatic with Kanan very early on in the season. Kanan’s an incomplete Jedi. As much as we have to track Ezra’s ascension, we have to parallel Kanan’s own wisdom and what he’s learning. Kanan’s hesitations this year, his reluctance to embrace the rebellion, and his unwillingness to commit to what they could gain out of the Temple all point to him not embracing leadership like he should. He doesn’t trust himself enough yet. 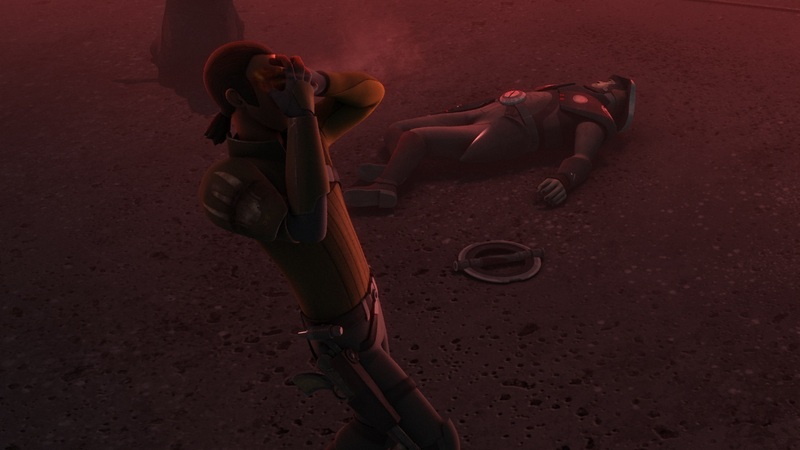 So, the blinding of Kanan really is symbolic in that he can’t see what the right thing to do is. He can’t see what he has to offer Ezra. It’s a constant problem for Kanan, so we take that one ability away. It has affected our storytelling, but not in the ways that people would think. There’s a lot of thought that’s gone into what does it mean for him to be blind and how he would react to that. People think, “Oh, but the Force will allow him to do things.” The Force is not a super power. It doesn’t work that way. It’s a matter of what you’re willing to believe. I think the story that we tell with Kanan and his blindness is simple — you are as limited as you allow yourself to be. You’re going to be able to see if you believe you can see and this can open up new things you couldn’t see before. 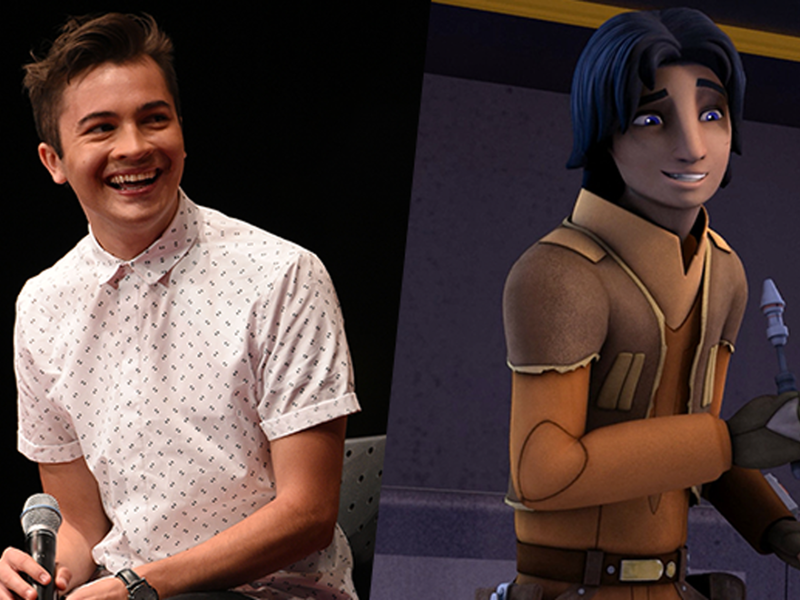 There’s an important character that Kanan will meet in Season Three that is going to help change his perception. StarWars.com: So, Ahsoka versus Vader. This was something that was anticipated for a long time. How did it feel for you when it was actually a reality? “I have to sit down and write it and we’re going to make it real.” I mean, was that surreal for you? 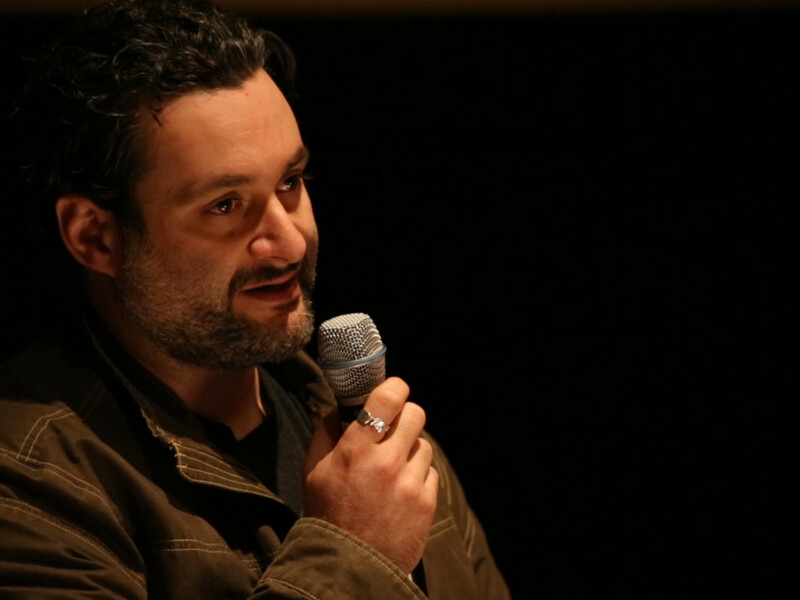 Dave Filoni: It was very surreal. I’ve been thinking about it for years, but actually doing it is very different. I felt a tremendous responsibility to do this the right way. I decided she should introduce herself with a playful barb that reflected their relationship as Master and apprentice. When she says, “It wouldn’t be the first time,” it’s an admission. She’s saying, “I know who you are. I know you’re Anakin Skywalker. I know you used to screw up all the time.” When he turns to her, he says, “It was foretold that you would be here,” because the Emperor told him that this was going to happen. That he would face his former apprentice. When I wrote the line, “Our long-awaited meeting has come at last,” I thought it might be too on the nose, but when James [Earl Jones] said it, I can’t imagine Vader not saying that now. It really connects to the ideas of the same things he says to Kenobi. “I’ve been waiting for you, Obi-Wan,” and so it’s right in that realm and it just feels right. In the last few moments of the finale, I wanted to show that while Ahsoka mostly believes it’s Anakin by that point, she’s not completely sure and she’s looking for a way to deny it. When Vader threatens Ezra with torture, she’s confused. Anakin would never torture children — not the Anakin she knew, at least. She’s looking for anything that she can grab onto that would prove that he isn’t Anakin. She doesn’t want to have to destroy this evil person, because if it’s Anakin, she can’t do it. She has the same problem Luke had. He couldn’t kill his own father. Not even Obi-Wan could kill his own student. That denial that Anakin is Vader in that moment allows her to draw her weapon and say, “I am no Jedi.” She is declaring her independence and striking at him to kill him in that instant. StarWars.com: Is that a bad thing? Dave Filoni: No, it’s not necessarily a bad thing. But in her heart of hearts, it’s probably not what she wants to do. 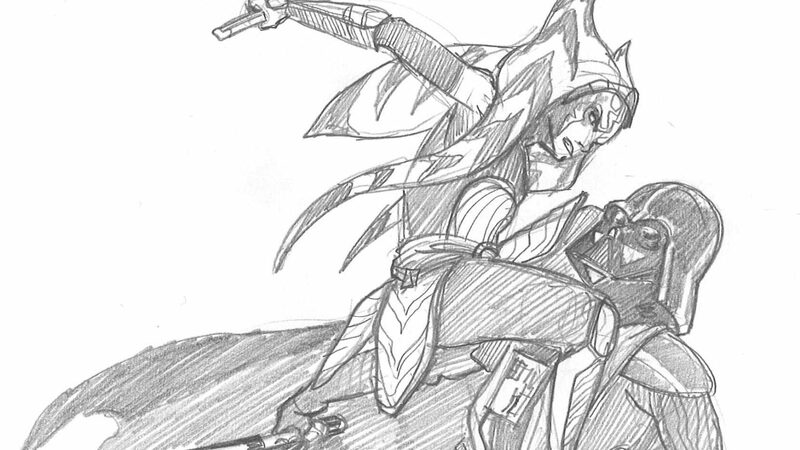 Ahsoka doesn’t fear Vader. She fears for her friend and that he’s become this terrible thing, so she’s trying give herself the power to destroy him. I don’t think she would ever believe that Anakin was capable of being Darth Vader if she didn’t see him under the mask and hear his real voice. StarWars.com: When you hear Vader speak, you actually hear James Earl Jones and Matt [Lanter] at the same time. Was that something you always planned? Dave Filoni: Yeah, I’ve been after that for years. I’ve had this fascination for a long time that Anakin’s voice is augmented as Vader. The Emperor knew that modifying his voice was another way to disguise his identity. That’s why he doesn’t sound like Anakin. So, when the mask is broken and severed, his true voice comes out. The first time you hear it, it’s James Earl Jones’ voice over Matt Lanter’s voice. The second time he says Ahsoka’s name, it’s Matt’s voice over James’ voice. The third time Vader speaks and says, “Then you will die,” it’s actually only Matt Lanter with his voice modulated deeper. 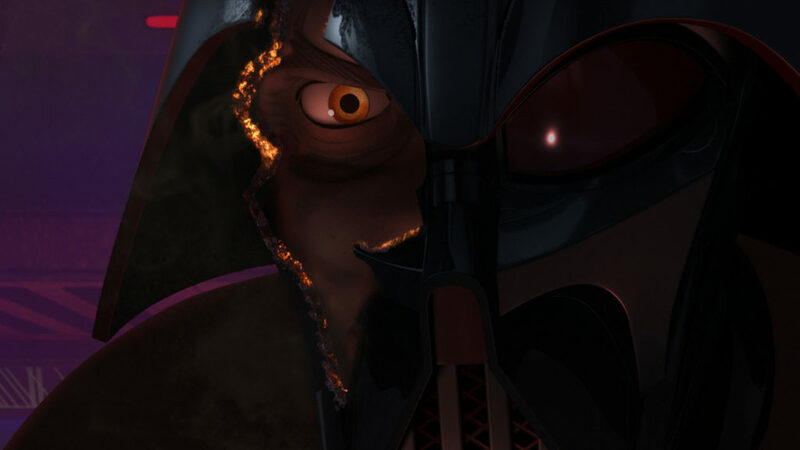 Dubbing the voices together felt like a great way to fuse the idea of Anakin and Vader as one. 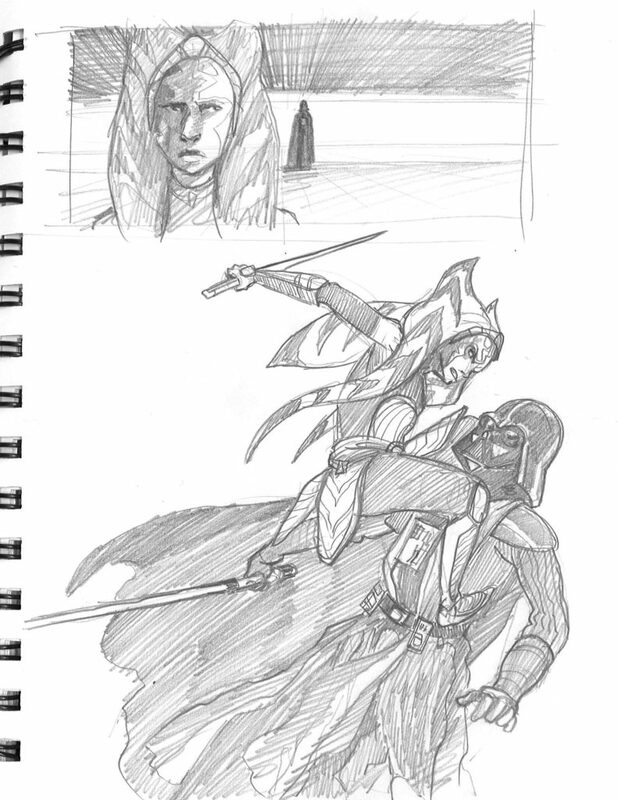 Sketching a classic: Original concept sketches of the Ahsoka versus Darth Vader duel from Dave Filoni’s sketchbook. StarWars.com: I’m wondering if you can talk about the pacing and choreography of the duel. I feel like there are some fights that deliberately recall other Star Wars battles; for example the Sidious, Maul, Savage fight [from The Clone Wars] feels very Revenge of the Sith to me. 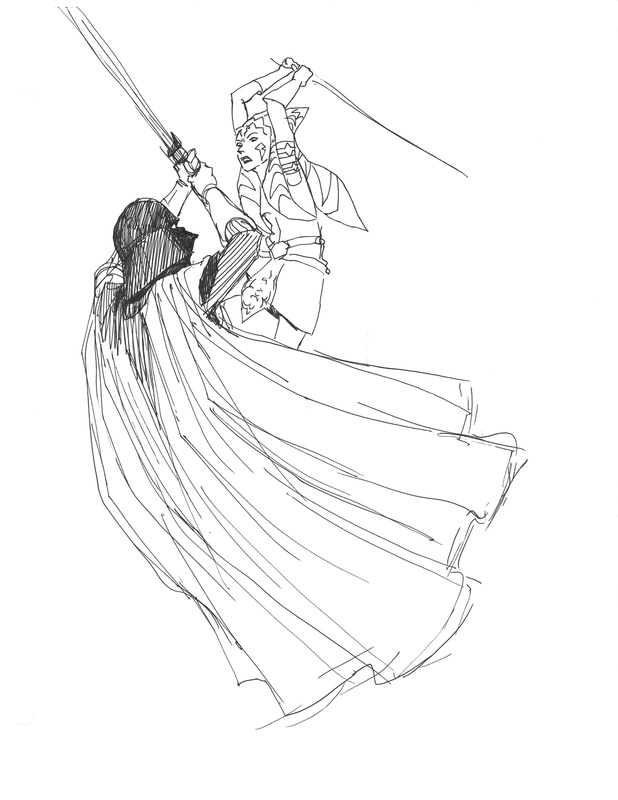 When I was watching Ahsoka versus Vader, I couldn’t really place it with any other lightsaber duel in terms of feel. Something was different about it. 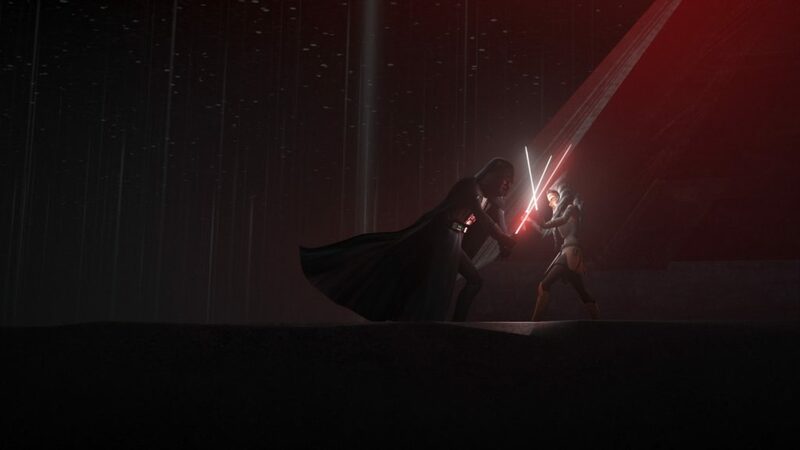 Dave Filoni: That’s one of the few lightsaber fights that I’ve boarded myself. I generally rely on members of my team that I think are far better at sword fighting than I am. Steward Lee is my martial arts master; I rely on him for many things. In fact, I wrote an episode for Season Three that I made sure got into Stew’s hands because I wanted some very accurate swordplay in that episode, and I knew that Stew could deliver it. The most important aspect of any good lightsaber fight, to me, is what proceeds it and what follows it. I think we had a great emotional lead up to the Ahsoka-Vader fight and things really reached a crescendo when she severed his mask. That scenario is something I’ve had in my mind for years, but in early versions it was dialogue free. Simon suggested that the moment went by too quickly, so that’s when I added “I won’t leave you, not this time,” and “Then you will die.” It’s just two lines, but the emotion behind them made a tremendous difference. One huge benefit I have on this show is the ability to have Simon and Kiri [Hart] sit and watch the content. George [Lucas] would do that as well, and I’m glad I haven’t lost that support system. It’s important for directors to be open to ideas and comments and then use that feedback to benefit the story. The Season Two finale is probably the greatest group effort we’ve had at Lucasfilm Animation so far, and I think it shows by the way the audience reacted to it. 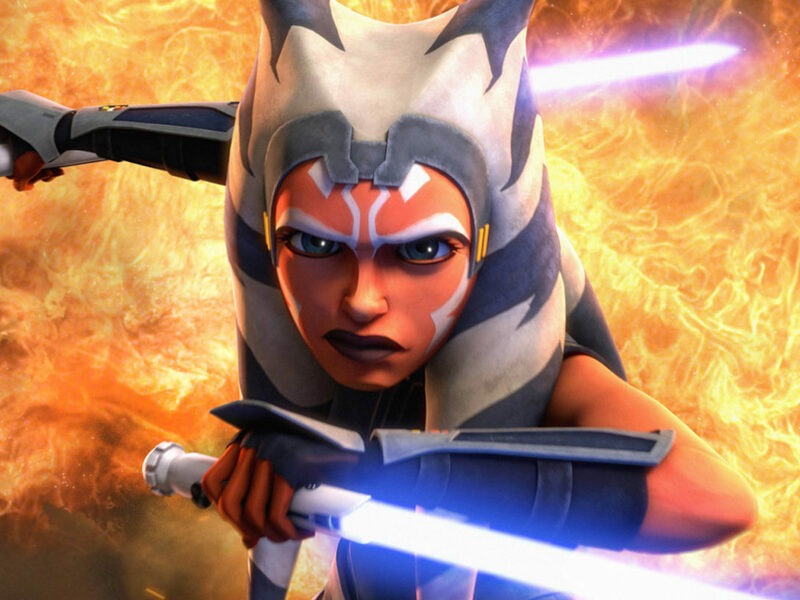 StarWars.com: Can you just talk about what you feel about this character — Ahsoka, that you created and have shown us her life — leading to this point where she’s battled Darth Vader? Dave Filoni: We knew from the beginning, in talks with George, that she was a character that could be pretty polarizing because she was young and brash. We were aware of that, but still we wanted to attempt it. 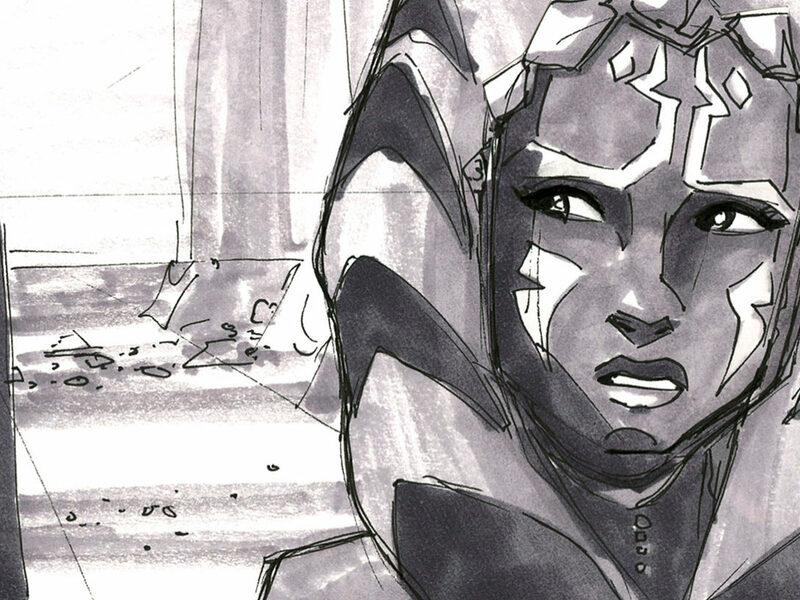 I remember warning Ashley, saying, “You know, this is a character that isn’t necessarily going to be universally liked in the beginning, so you’re going to have to prepare yourself.” What I like the most about Ahsoka is that any respect that she’s gained, the character, and the crew who had to work on her in the various shows, had to earn. Nothing came easily. Nothing came for free and I think that makes us all like her even more. I don’t know that we could have guessed the outcome all these years later. You can only hope that a character you create might mean that much to fans. In the lead up to the Season Two finale, people were literally pleading for her life on my Facebook and Twitter pages. I certainly value that and I know my whole crew did. We are really, really grateful for the fan support from around the world. I hope through Ahsoka we showed fans that the universe has many possibilities. We had her wielding a lightsaber and going toe-to-toe with the big baddies of the galaxy years ago. I like to think that Ahsoka paved the way for a character like Rey [in The Force Awakens]. It’s great that kids have so many options and strong characters to emulate. They’re interesting, diverse personalities that have opinions, strengths, and weaknesses. They are a reflection of our real world, which is how it should be.